Owing to the year-end break at WHCL, RADIOLA! will be taking the week off. Your host will be spending a few days up around Lake Lacuna, and will return June 2, at 7 PM EST with the usual fish stories to tell. The Live365 feed should continue uninterrupted, as always. 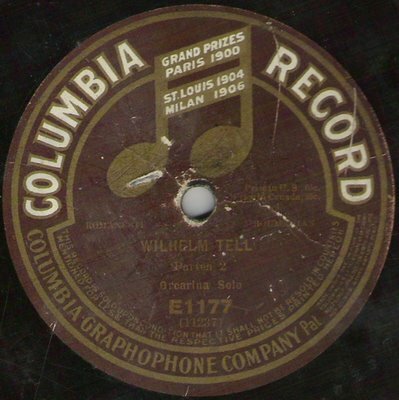 The quaint, scratchy acoustic recording of the William Tell Overture I've used as the RADIOLA! theme is no longer anonymous. I discovered that that amazing ocarina solo is by none other than Mose Tapiero, possibly the greatest ocarina player of all time. I compared the matrix number of my "anonymous" recording with the list on the Mose Tapiero discography, and it matches up. The recording I use was first issued in 1912. And nobody seems to know a thing about Maestro Tapiero, other than that he could blow one mean sweet potato. My salute to the Graduates at 7 PM EDT on WHCL--CONGRATULATIONS!! This Very Special RADIOLA! is dedicated to those among us who (owing to the unfashionable manifestation of our metabolical imbalance) are subject to the slings, arrows, brickbats, and divers blunt instruments of even those who proclaim themselves Politically Correct. (Actually, especially them. They have to take their nastiness out on somebody.) This RADIOLA! is comfort food for the large person's soul--three hours of music including stellar performances by some of the biggest (and heaviest) stars of early pop and jazz. There is also an abundance of suitable topical material, some requests, and a few incongruities. This show is packed with music for your enjoyment--and to keep me from editorializing more than is absolutely necessary. The fun starts at 7 PM, as it will for the remainder of the summer, on WHCL-FM 88.7, in Clinton, NY, at beautiful Hamilton College. As of May 12, RADIOLA! will air from 7 until 10 PM ET Fridays on WHCL-FM (88.7). Immediately afterward, at 10 PM, my friend Alex Jager will be hosting his aural fantasmagoria TRIPPING WITH DOLPHINS. Alex's show is totally unlike RADIOLA! but his poetic monologues, in-depth interviews, and psychedelic playlist make for one of the most intriguing programs you are likely to hear on American radio. It will remind you of underground radio circa 1968. This Friday's RADIOLA! (8 PM ET on WHCL) contains as much necessary roughness as the FCC allows. "Kinder, gentler" times (and tunes)? I think not. How'd you like an audio knuckle sandwich? All right, then--you asked for it! Your host's MySpace page. It was only a question of time, Dude.